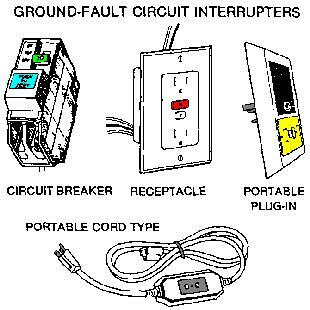 1:5:10:277 EcoTip: Ground Fault Interrupter Circuits are a from of electrical protection that can provide extra protection beyond that of the circuit breaker. Everyone should be familiar with the GFICs that are required by code for protecting rooms with water like bathrooms, laundries, and kitchens. It also makes sense to use a GFIC protected extension cord when using electric trimmers, lawn mowers or power tools. The U S. Consumer Product Safety Commission (CPSC) recommends the use of a ground-fault circuit-interrupter (GFCI) with every power tool to protect against electrical shock hazards. Each year, CPSC learns of approximately 20 to 30 electrocution deaths associated with power drills, saws, sanders, hedge trimmers, and other electric power tools. Most of these deaths could be prevented by the use of a GFCI. A GFCI constantly monitors current flowing in a circuit to sense any loss of current. If the current flowing through two circuit conductors differs by a very small amount, the GFCI instantly interrupts the current flow to prevent a lethal amount of electricity from reaching the consumer. The consumer may feet a painful shock but will not be electrocuted. Grounding may provide some protection for power equipment and double insulation of newer power tools presents lower risks of electrocution. However, GFCls are the most effective means for protecting consumers against electrical shock hazards. Since 1973, homes built according to the National Electrical Code have varying degrees of GFCI protection. GFCIs were first required in outdoor receptacle circuits In 1973, bathrooms in 1975, garage wall outlets in 1978, some kitchen receptacles since 1987, and all receptacle outlets in unfinished basements and crawl spaces since 1990. Three common types of GFCls are available for home use: circuit breaker, receptacle and portable types. The circuit breaker type needs to be installed by an electrician. The receptacle type may be installed by knowledgeable consumers familiar with electrical wiring practices. The portable GFCI needs no special knowledge to install Just plug the portable GFCI Into a wall receptacle and then plug the electric power tool into the GFCI. It is generally priced below $30 and is available at hardware stores, building supply centers and electrical supply houses.